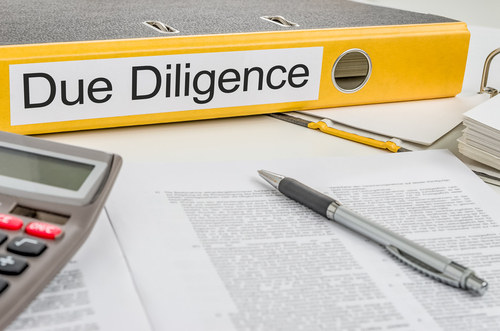 Due diligence (DD) is the process of appraising a business prior to its acquisition. Usually initiated by a potential buyer, DD looks in detail at a company’s operations, finances, contracts, assets and liabilities in order to determine whether it is a commercially viable business and a worthwhile acquisition. The process is used to identify any risk associated with the purchase whether legal, regulatory, financial or commercial. Its findings typically influence deal structure and terms and may affect the final sale price. In case any risks associated with the business or its acquisition cannot be adequately addressed, the DD provider is required to conduct an audit within a set time period (specified in a letter of intent) to ensure that the process does not go on indefinitely and that there is as minimal disruption to the business as possible. Depending on whether the purchase is one of assets or sales, DD can involve looking at every aspect of a business, including its legal and tax compliance, financial and sales records, business operations, assets, expenses and debts. The terms and conditions of any applicable lease agreements and what the buyer’s obligations and rights are in regard to such agreements. Any outstanding notices or government requirements for work to be carried out on the premises, such as water or sewerage work. Any current or pending legal proceedings that may have been instituted against the business or the person selling it. Whether there are any capital gains tax implications, such as those that apply if the business is sold again within one year of purchase. If there may be stamp duty implications, such as those that would apply if the buyer plans to restructure the business. What the GST implications are for the buyer. Whether the assets of the business have been valued for the best tax advantage. Analysing its financial records over the short to medium term (past 3-5 years) to confirm historical performance and determine future cash flow and profitability projections. Examining the accounts receivable with regard to any doubtful debts or payments made to the seller such as deposits that may be owed to you. Whether they are accurate, or whether bad debts are still recorded as receivables. Whether sales patterns are consistent or fluctuate according to seasonal factors or business cycles. Whether sales levels can be maintained and improved with current resources. Whether a few particular clients or salespeople are responsible for a large percentage of sales. Whether the buyer has obligations with regard to existing warranties on goods sold. Whether it is part of a group or franchise, which could restrict the buyer’s autonomy. Whether it has all the necessary authorisations and licences to carry out its functions. Why the owner is selling and whether they intend to operate in competition to you in the future. Whether the seller is pivotal to the success of the business and whether the buyer has the necessary skills to fulfil the vacated role. Whether the business is in a good location and if this is likely to continue. The current state of the industry and whether it is likely to expand or contract in the future. Where the business ranks in relation to its competitors. Whether the same suppliers will be accessible on the same terms. The book value, market value and replacement value of the fixed assets,which the buyer will pay for. The intangibles and whether they are transferable to the buyer. That the inventory has been accurately valued in cost of goods sold statements. Whether plant and equipment is owned or leased, in good working order and if reasonable depreciation is being claimed. Whether any large expenses have been put off by the seller. Whether any large expenses are likely in the near future. Whether there are any ongoing expenses such as advertising costs that the buyer would be obliged to honour. What the terms of repayment are and whether there are any risks for the buyer. Whether the business generates sufficient cash flow to cover its debts. When you’re looking at acquiring a business, due diligence is a way of ensuring you know exactly what you’re buying. It should be a part of every acquisition, because unless you know the true value of a business, you can never be sure whether you’re buying an asset or a potential liability.